^ 1.0 1.1 NEO Groups. NASA/JPL Near-Earth Object Program Office. [2012-06-04]. ^ 2.0 2.1 Richard Monastersky. The Call of Catastrophes. Science News Online. March 1, 1997 [2007-10-23]. ^ Clark R. Chapman. The hazard of near-Earth asteroid impacts on earth. Earth and Planetary Science Letters. May 2004, 222 (1): 1–15. Bibcode:2004E&PSL.222....1C. doi:10.1016/j.epsl.2004.03.004. ^ 5.0 5.1 Shiga, David. New telescope will hunt dangerous asteroids. New Scientist. 2006-06-27 [2008-11-15]. ^ Potentially Hazard Asteroids. NASA/JPL Near-Earth Object Program Office. [2011-05-05]. ^ Dan Vergano. Near-Earth asteroids could be 'steppingstones to Mars'. USA Today. February 2, 2007 [2007-10-22]. ^ Rui Xu, Pingyuan Cui, Dong Qiao and Enjie Luan. Design and optimization of trajectory to Near-Earth asteroid for sample return mission using gravity assists. Advances in Space Research. 18 March 2007, 40 (2): 200–225. Bibcode:2007AdSpR..40..220X. doi:10.1016/j.asr.2007.03.025. ^ Donald Savage and Michael Buckley. NEAR Mission Completes Main Task, Now Will Go Where No Spacecraft Has Gone Before. National Aeronautics and Space Administration. January 31, 2001 [2007-10-22]. ^ Don Yeomans. Hayabusa's Contributions Toward Understanding the Earth's Neighborhood. National Aeronautics and Space Administration. August 11, 2005 [2007-10-22]. ^ Emily Lakdawalla. Chang'e 2 imaging of Toutatis. ^ Portree, David S. Earth-Approaching Asteroids as Targets for Exploration (1978). Wired. 2013-03-23 [2013-03-27]. People in the early 21st century have been encouraged to see asteroids as the interplanetary equivalent of sea monsters. We often hear talk of “killer asteroids,” when in fact there exists no conclusive evidence that any asteroid has killed anyone in all of human history. ... 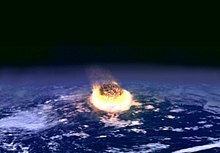 In the 1970s, asteroids had yet to gain their present fearsome reputation ... most astronomers and planetary scientists who made a career of studying asteroids rightfully saw them as sources of fascination, not of worry. ^ 16.0 16.1 Fernández Carril, Luis. The evolution of near Earth objects risk perception. The Space Review. 2012-05-14 [2012-05-25]. ^ P. Brown, R.E. Spalding, D.O. ReVelle, E. Tagliaferri and S.P. Worden. The flux of small near-Earth objects colliding with the Earth (PDF). Nature. 21 November 2002, 420 (6913): 294–296 [2007-10-23]. PMID 12447433. doi:10.1038/nature01238. ^ Don Yeomans. Small Asteroid Predicted to Cause Brilliant Fireball over Northern Sudan. NASA/JPL Near-Earth Object Program Office. October 6, 2008 [2008-10-09]. ^ Richard A. Kerr. FLASH! Meteor to Explode Tonight. ScienceNOW Daily News. 6 October 2008 [2008-10-09]. ^ Don Yeomans. 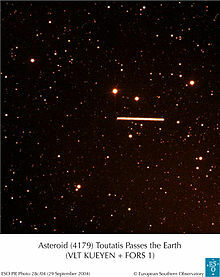 Impact of Asteroid 2008 TC3 Confirmed. NASA/JPL Near-Earth Object Program Office. October 7, 2008 [2008-10-09]. ^ Richard A. Kerr. Asteroid Watchers Score a Hit. ScienceNOW Daily News. 8 October 2008 [2008-10-09]. ^ Little Asteroid Makes a Big Splash Sky and Telescope, October 9, 2008. ^ Don Yeomans, Paul Chodas and Steve Chesley. Asteroid Impactor Reported over Indonesia. NASA/JPL Near-Earth Object Program Office. October 23, 2009 [2009-10-30]. ^ Meteorite slams into Central Russia injuring 1100 - as it happened. Guardian. [16 February 2013]. ^ http://en.rian.ru/world/20130216/179501992.html "Hail of Meteorite Fragments Hits Russia: Meteorites Could be Worth Big Bucks“, by: Maria Young, RIA Novosti, February 15, 2013.